Some months ago i have realized that a square wave produced of a triangle osc and the square wave produced of a comparator processing the triangle wave of the same osc ... has a 90° phase difference. I thought this could be usefull in a frequenzyshifter application. But recently the friendly voice in my head told me how it could be used for "supersimple triangle-ish quadrature funktion generator". attached the concept of the 90° squarewave, the whole quadrature circuit and the evidence scope from the breadboard test. together could get some interesting results as they are created from 1 oscillator so it would not be drifting in/out of phase. 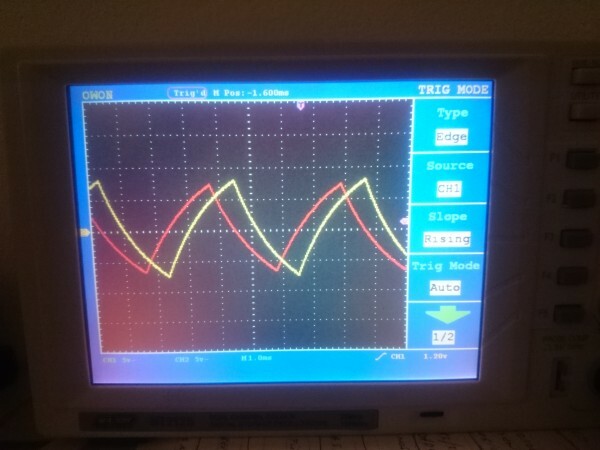 i have simulated some things with the standard tri/sqr VCO, but there the output tends to drift away from the 0V line. until now i did not found a solution for that. till now the relaxation osc it works fine. the tolerances of the caps and pots are only resulting in amplitude differences. i will try it the "normal" tri/sqr osc tomorrow. after finishing the sequencer thing (i need to post the schemo, sometime), i have layed down the soldering iron, and the friendly little voice in my head told me that it is time to quit. but iam full of positive memories, especially of those moments when a circuit have worked . It will always be a part of me, and iam 100% shure iam getting back to it one day, and of course follow this wonderfull forum and may i give my 2 cents from time to time (always hoping it will be usefull), and, like now, completing unfinished task like now. long story short. while cleaning the HD i came accros a book that i had never read, and there was written the answer to the drift problem. 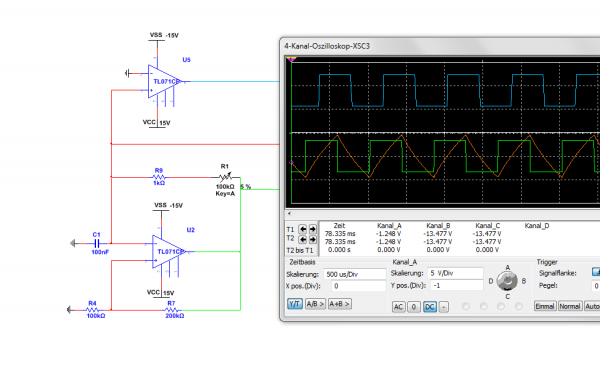 the answer is: a feedback resistor, which is stabilizing the amplitude of the 45° integrator. And if ther is a generator there should be an oscillator, and if there is an oscillator it should go thru zero. 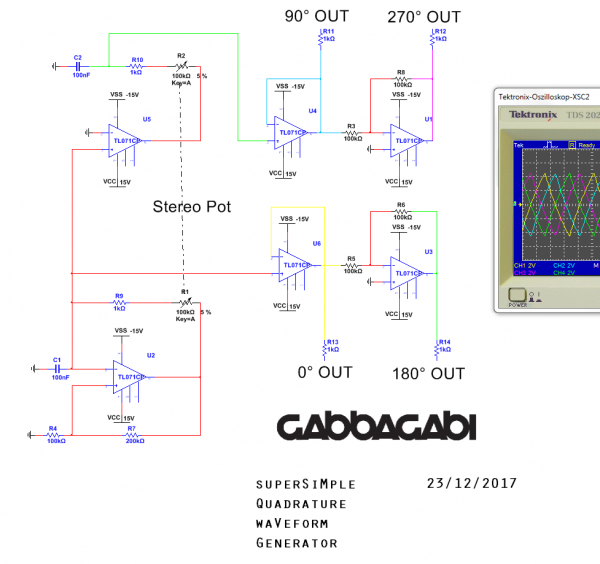 keep in mind it is a simulation and play with the cap and integrator resistor values to make it more low or high frequency. 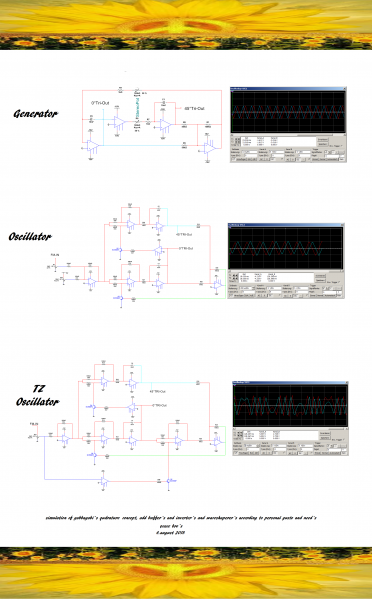 To accomplish full quadrature u need to add some inverters. Aha, one of these is used in the Electroharmonix Flanger Hoax! dont know that, do u have a link to the schemo? I’m sorry to hear that you’re moving on and I hope you will be back some time. I wanted to say that I have really enjoyed your posts and thinking over your designs. The true DIY spirit lives in your creations. Sorry to hear that too, I learned so much from your posts.You're very creative. Thanks for sharing, and keep moving forward..
thx for your kind words mates. May i should have formulated this a bit less dramatic, but it was the feeling of this moment, and everything is still packed in boxes. I had an SDIY overkill and I had some time now to think about. the second one is a little bit harder to overcome. may i should ask here in the forum for help? for the 2nd .. I occasionally look around to see what modules or features other synths have .. or I hear some sound which makes me wonder how to exactly do that .. which will sometimes result in ideas for a new module for my soft synth. But the latest idea I had came from a TV guide (for lightning simulation .. not even sure yet how to translate that into audio ... but it keeps me from the streets at least). Did you do any delay line based stuff already? maybe with them analog bucket thingies .. or with plain digital RAM even. Formant filters are nice .. the ones that can do vowels ... or even nice bell sounds. Anyway .. sometimes I think ... hmm .. I have everything done ... but always there after a while there will be some new ideas to try. of course there is so much to explore outthere! If i only remember when i saw those beautifull Manhatten-Style builds, or the pad-island stuff, i was kind of jeallous and thought: how sweet the life must taste without IC´s. May the original Steiner-Parker from the yusynth archive first? to get into the mood?